Cut the bottom half of each sausage into six sections to form the legs. Grill sausages for 3-5 minutes, turning occasionally to avoid burning. The "legs" will curl up. Combine the BBQ sauce and honey. Stir until combined. 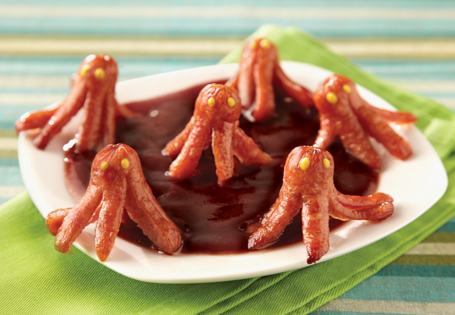 To serve: Place some sauce on a plate and top with five sausages, "legs" in the sauce. With a toothpick, place two dots of mustard on each sausage representing "eyes".